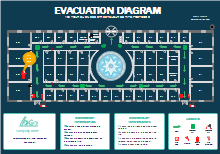 Use these escape plan as guide in emergency evacuation guide. They will be beneficial to protect people and property. These templates are made by Edraw requiring only a few minutes. You can also easily draw useful and unique escape plans like these ones in Edraw. Free download escape plan templates on professional diagram sharing community. 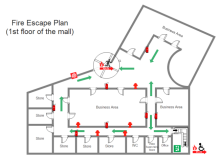 With Edraw, you can edit and print the free escape diagram templates for personal and commercial use.